Market failures is an important subject in economics because they give arguments for government intervention in markets. What are the different causes? Externalities Externalities are positive or negative impacts of the production and consumption of products which affect the third-party i.e. anyone who is not the producer or the consumer of the product. The problem with this is that if a good has lots of negative externalities (e.g. tobacco), it is being overproduced. This is because the negative consequences of the good are falling on third parties, such as the general public if the producer or consumer were made to pay for these externalities then less of the good would be produced and consumed and society would be better off. Inadequate provision of goods and services This is when the free market fails to provide certain goods and services. Public goods come under this heading. Public goods are goods or services that cannot be provided efficiently by the private sector. E.g. the army. Merit goods also come under this heading. Merit goods and goods or services that can be provided by the private sector but are often under produced due to their positive external benefits they bring to society. Therefore the public sector often provides merit goods as well. An example of a merit good is education. Asymmetric information This is when one party in a transaction has more information than the other and as a result the market is unable to work properly. An example of a market where asymmetric information exists is the second-hand car market. The seller of the car will know more about the condition and reliability of the car than the buyer and as a result they are unlikely to agree on a price that reflects the true value of the car. Imperfect competition This is when a market has very few firms competing in it. As a result, the firms will have very little incentive to reduce prices and stay efficient in their production. Oligopolies are a form of imperfect competition. In an oligopoly, two or three firms have significant market power and often raise their prices due to the lack of competition. Externalities These are negative or positive consequences that are not accounted for in a market transaction. 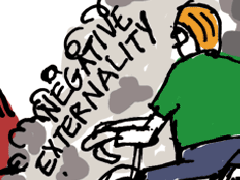 Examples of negative externalities are pollution or congestion. Imperfect market This is a term that describes any market structure between the extremes of perfect competition and pure monopoly. Duopolies, oligopolies and monopolistic markets are all imperfectly competitive market structures. Merit goods These are goods that bring wider benefits to society if they are consumed. They are generally under-supplied by the private sector so the government provides them as well. An example of a merit good is education. Public goods These are goods or services that are non-excludable (meaning you can’t prevent people from using it) and non-rival (meaning it doesn’t cost any more to supply an extra person) therefore they are provided by the government.